Boba Fett a bounty hunter who grew up on hatred for the Jedi and became a bounty hunter at a young age. After getting his jetpack broke, its not like han solo shot him, he literally swung blindly ba dump ba and managed to clip bobas jetpack while he was about to snipe luke. Dude, he waved his hands around like a fool and screamed like a girl. A real man would have tried to get hold of the situation. Like detach his backpack? Or grab onto something or do anything. Instead he went out like one of the Three Stooges. Boba Fett is the most overrated character in cinema history. Exactly. How about fly up until you regain control? Or fly into the bazillion miles of nice soft sand and not the only digesting pit? Hasn't he logged tons of jetpack hours? Isn't he a professional? And how does it make a difference that his jetpack went off unexpectedly? Fett apologists, geez. That said, saying he screamed like a girl is a little insulting to girls. Any girl worth her salt wouldn't have screamed as the situation wasn't particularly terrifying (she also woulda got control of her jetpack). More of an 'Oh crap!' moment than anything to scream about. Fett is a great example of a great minor character that Lucas ruined. ESB set him up as a cold, calculating bounty hunter. Like it did to a lot of serious plot elements in ESB, RotJ turned them into a joke (see also: Han). Lucas also decided to give him a brief backstory in Ep2 for almost no reason, further making him a joke ("he's a bounty hunter 'cause he saw his dad get killed"). He didn't need a backstory, he didn't need a stupid death - in fact, he could have been left out of all the other movies and he'd have been a lot more interesting overall. ESB Fett could easily have bested Cad Bane, and RotJ Fett would have likely tripped on something before the match even started, set off his rocket, and killed himself. I so despise the CLone Wars being cancelled - so many open plots, like Darth Maul and Mother Talzin (which was concluded by way of a comic book - how poor!) Also Vantresses' fate! This looks like an amazing scene - should have made it in somewhere, Rebels if not Clone Wars. I hate how Clone Wars introduced new villains that were cool and quickly became loved and infamous within the franchise - only to discard their fates to comic books or nothing at all - just disappeared. Correction: he screamed like a Wilhelm. I was gonna ask, but then I remembered what it was. Yeah, but at least Star Wars Rebels attempted to pay homage to The Clone Wars by featuring characters such as Darth Maul, Bo Katan, and Ahsoka Tano, so at least some of the storylines and characters got to have their arcs continued. It sounds like Clone Wars Seasons 7 and 8 would have been some of the best, however. 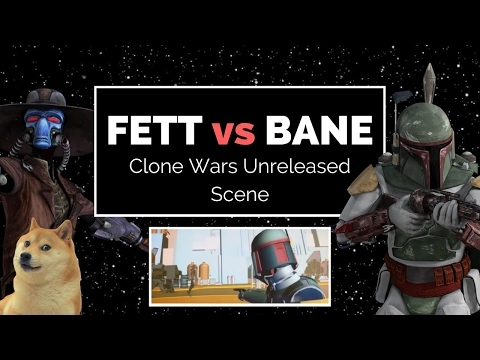 I’m not going to lie, I would’ve been **** if they killed off Cad Bane by a preteen Fett. Dude tangled with Jedi repeatedly, and the Undercover Obi story arc was one of my favorites. Bob wins. I must admit I'm bit of a fanboy, but my main reasoning is that I grew up with the legends Boba. I loved that Bob's and was easily the one of my frustrations with legends being discontinued(second to only Ben Skywalker). I think they should have done a Marvel thing and kept both as different universes, with Disney's being the 616 equivalent. Cancelled or not, Boba killed Cad in a duel. The question is who would win in a fight, not a duel, considering they both killed eachother, if not for boba's helmet. Which brings me to my answer. Boba has anger and gadgets; Cad has wit and cunning. In a true fight, cunning wins. Plus, he ties with Embo as the coolest of all the bounty hunters; Boba's a schmuck in cool armor (which no one else seems to need).